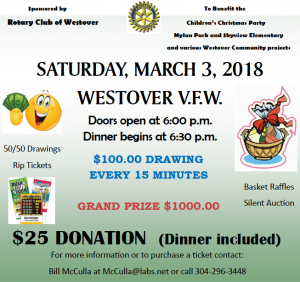 The Rotary Club of Westover has scheduled its annual Cash Bash fundraiser for Saturday, March 3 at the Westover VFW. Doors open at 6:00 p.m., and Dinner begins at 6:30 p.m. The evening includes a $100 drawing every 15 minutes, Basket raffles, Silent auction, 50/50 Drawings and a Grand Prize of $1,000.00. Proceeds will benefit the annual Children’s Christmas Party. One hundred needy students from Mylan Park and Skyview Elementary schools participate in an annual Christmas party, sponsored by the club, that includes gifts for the kids, a pizza and ice cream party, a visit and picture with Santa. Club Secretary, Deborah Koon-Friel, said the Cash Bash also helps support various Westover community projects such as Miracle Field, Wesmon Youth Baseball, sending boys or girls to various camps throughout the State and as far as we can stretch the dollars. “Our club is very passionate about helping others, especially the children”.